Rappeling, although it may seem very simple, can be one of the most dangerouse climbing or mountaineering technique. All together, if we are not perfectly sure how to rappel safetely and efficiently, can cause accidents. Set the belay for a rappel. Rappeling with a self-blocking knot. How to ascend a rope. Rappeling with an injured partner. 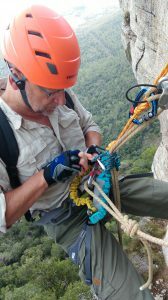 This course can be taught after a via ferrata or a multi-pitch climb, or if you prefer, on a single rappeling course format.